Notes from the Cuban Exile Quarter: Cuban prisoner of conscience marks 803 days in prison. Cuban prisoner of conscience marks 803 days in prison. 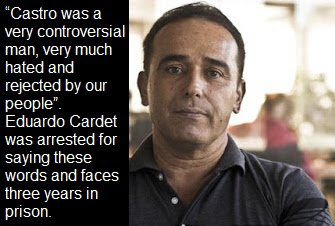 Dr. Eduardo Cardet has spent 803 days unjustly imprisoned and separated from his family. Eduardo is a medical doctor, a husband, a father of two small children, and the national coordinator of the Christian Liberation Movement (MCL). 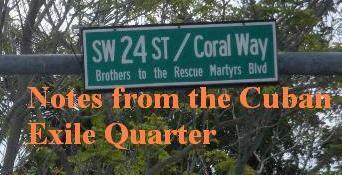 MCL is a nonviolent movement that has sought civic means to achieve democratic change in Cuba. Fidel Castro died on November 25, 2016 while Cardet was outside of Cuba. He was interviewed by international media and gave a frank assessment of Fidel Castro's political legacy and said that there was nothing positive. He returned to Cuba and was beaten up and arrested in front of his wife and children on November 30, 2016. Since that day he has been arbitrarily and unjustly detained by the Castro dictatorship. Refusing to mourn Fidel Castro's death is punishable by prison in Cuba, and offering a nonviolent political alternative to the existing system is grounds for a prolonged prison sentence. In March of 2017 he was sentenced to three years in prison, and Amnesty International recognized him as a prisoner of conscience. The Spanish Senate, members of Congress, international human rights gatherings, civil society and the Christian Liberation Movement have called for his immediate release. Today, his plight is not forgotten and in the United Kingdom calls for his freedom continue.